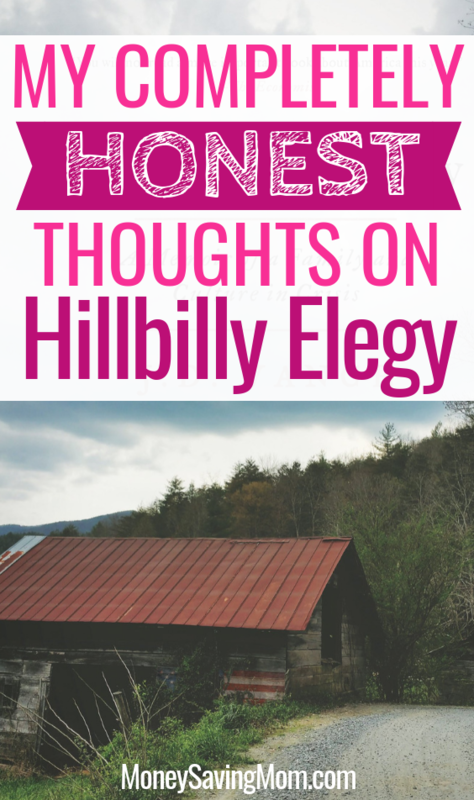 I’ve seen Hillbilly Elegy mentioned over and over again by various different people online and in podcasts. I didn’t plan to read it because the premise didn’t really interest me that much. But then I saw that it happened to be available on the Libby app, so I went ahead and put a hold on it just because so many people had recommended it. I thought the book was surprising, pretty fair and balanced (I expected the author to lean strongly to one side of the political aisle or the other — and that the book would be more politically charged as a result), and a very insightful look into how our upbringing can affect our life trajectory in such a powerful way. While I wish there weren’t so much crass language and cussing in the book (though I think it’s likely just the author being truthful and honest to how his family actually talked), I think the book is worth reading — if you can stomach all of the f-bombs in it. I would be curious to hear from other people who were raised in this same region and social class — to know their perspective on the things he shares. It’s the type of book I’d love to read with a Book Club because I found it caused me to have so many thought and questions and things I wanted to discuss with others who had read it. Have you read it? If so, I’d love to hear what you thought — whether you liked it or totally disliked it. Looking for more? Read more posts about Books Read in 2018 & Honest Product Reviews. My thoughts are very similar to yours. I read it last year and the language is rough but I don’t think it’s gratuitous if that makes sense. That’s honestly how he was raised and I think it was being true to the experience. I grew up in rural Arkansas and I absolutely felt an odd connection to many parts of the book because of that. Thankfully my immediate family wasn’t dysfunctional in that way but extended family, neighbors, etc. were. Another harrowing (and far more disturbing in my opinion) memoir is Educated. Oh, yes. I read both those books (Hillbilly Elegy was years ago, I think). Educated… gosh it was eye-opening. Crystal, if you haven’t read Educated, and found Hillbilly Elegy fascinating, I recommend Educated! I’ve got Educated on my reading list. Have heard it is riveting. I read it and liked it – especially his point that we need a strong social safety net along with personal responsibility/grit. I do think that it also showed the NEED we have as a country for financial literacy – if I recall correctly, it was his CO in the Navy who helped him figure out interest rates on loans and budgeting and stuff. I think that sort of thing should be taught as “life skills” to kids in high school to help people get started with a basic knowledge of how money works. I loved it! Super enlightening. I read it during the last presidential election and it really helped me understand a part of the population very different than my own, and helped me have more empathy for different world views. Taylor – I, for one, appreciate your insight and enjoyed reading a little piece of your story! Thank you so much for sharing, Taylor! I’m so glad you took the time to share — and I’m so glad that you had this space to share! I read it and had so many mixed thoughts about it. The language would peel the paint off the walls. And yet, and yet, and yet…to discover the influence of a grandmother over her grandson! A sister over her brother (and I think she is a half-sister, too). If we think we don’t make a difference…think again. Yes! It was so powerful to think of the influence we have on others — whether for positive or negative! I’m sorry, but I thought this book was awful. In my opinion, the author was incredibly arrogant and painted poor Southerners with an extremely broad brush. As a Southerner who grew up MUCH poorer than he, I found the overabundance of stereotypes insulting. While I personally know many people who would fit these stereotypes, such as the welfare abuser, the lazy worker, or the addict, so many more poor Southerners are simply good, honest, hardworking people who face lots of challenges with getting ahead in life because they lack the resources and structure of someone born into better circumstances. I feel there was a lot of blaming poor people for being poor. The author is certainly entitled to his opinion, and read solely as a memoir and not as a political “explanation” of poor Southern whites, it is a decent book. However, it is important to remember that this is only one perspective, and it is of someone whose life experience definitely does not fit the norm. That said, his journey was very admirable, but I feel that because he was able to “make it out”, it is very hard for him to understand why it is so very difficult for others to do the same. Also, it absolutely broke my heart to hear of the way he described his mother going from store to store to buy him a certain Christmas present in such a negative way. Even though there was much baggage in that relationship, and I see the point he was trying to make, it just hurt my heart that he seemed not to get that this was an incredible act of love by a very troubled woman. In my experience, I have not seen that rich people spend less on Christmas gifts than poor people, and have actually found it to be exactly the opposite. I also don’t believe that it is anything more than a personal financial decision to be made on a family-to-family basis, regardless of social status. I could go on and on, but in my opinion the back-patting and looking down on others was very prevalent throughout. Oh, and the language was also horrid. He was telling the story of his personal family not all southerners. As a southerner (and growing up a poor one at that), I didn’t feel he was saying all poor southerners or all southerners are the same as his own family and he writes honestly of their dysfunction. As a poor southerner who went on to be a first generation college graduate, I can appreciate how hard a path that is. I can also appreciate that others who stay put often think those who make different life choices are arrogant and think they’re better than others. Sadly it’s one of the cultural reasons many people stay in poverty. You’re also thinking of the South and not Appalachia specifically. I cannot stress enough the difference. Having grown up in Appalachia (and beyond thankful I got out), I could relate to so much. You don’t know it until you’ve lived it. Thanks for sharing your honest perspective — I really wanted to open up this space to hear from others who came from similar backgrounds. So I really appreciate you sharing! I just couldn’t get past the language! I wanted so badly to continue but couldn’t stomach it. I absolutely loved it. I grew up (and still reside) in Appalachia. While my childhood was much different from what is portrayed in the book, many of my family members (even first cousins) grew up in very similar situations. In some ways I feel like I ‘got lucky’ with my parents. I don’t know how they knew to take a different path (and it’s not something they like to discuss), but they just knew they wanted more for all of us. We are the first children with education beyond high school on one side of the family – we ended up with 7 college degrees between the 4 of us! But I think those (great) choices created a bit of a lonely life for my parents, we often get called ‘snooty’ or are accused of thinking we are better than the rest of the family, which could NOT be further from the truth! This book made me think deeply and answered a lot of questions I’ve wondered about for a long time. It’s my favorite read of 2018! So relate to your comment, Rachel! What’s even more interesting is seeing those choices reflected in their children and grandchildren. A reminder of how our choices continue on for generations. I read this book this summer and immediately after read The Glass Castle. I recommend both very highly!! Yes the language in them can be distracting but the overall messages are worth having to bounce over crude language. I feel that these books open our eyes to those living in poverty and create empathy. Reading these stories helped me appreciate the stable upbringing I had even more. I especially liked how J.D. mentioned the relationship between an unstable home life and school performance. I would encourage Christian teenagers to read both of these books, if for any other reason but to show them what struggles their peers may be experiencing. These books also made me wish school lunches would be free and available to all students without having parents or guardians going through an application process first. Oh! I need to read The Glass Castle — thanks for the recommendation! I read Glass Castle before reading Hillbilly Elegy and I wish I’d read them the other way around. I felt myself getting so angry at the parents in the Glass Castle that I almost couldn’t finish the book. The author of Hillbilly Elegy did a much better job at explaining why people acted the way they did and how that often played out for the kids in the home. Both books were eye opening but between the two I much preferred Hillbilly. I read the book so I was able to semi skim over the language. I think I would have had a hard time listening to it. What I thought was fascinating, regarding the language, was that it toned down significantly as the author moved from his hillbilly upbringing to college education and his professional life. I was glad I stuck with it through a rough beginning. I loved it and have always been fascinated by learning about different upbringings and areas of the country. I don’t remember much about the language – either it’s been so long since I read it or maybe the language was in context and didn’t bother me as much for that reason. I agree that it would be a great book to read and discuss with others!! I grew up in a town very near where the author grew up and am very close in age. Many of the people were only one generation removed from similar areas of Kentucky. I honestly felt like he was telling my family’s story and many of those in the town I grew up. I was reminded of my grandparents and my aunts and uncles and cousins and even my mother in some ways. My grandparents were amazing to me but were completely different people when raising my mother. I’m not a fan of the language but I do believe it is absolutely necessary to give the reader a glimpse into the people he is describing. My grandfather cursed so much he wouldn’t even realize it when someone pointed it out. I felt after reading this book I had a different perspective and understanding of my own childhood experiences and my extended family. Throughout the book I was reminded of that urgency I had to get out of my little town where everything seemed to be decaying…to have a chance, to overcome all those road blocks and everyone who told me an Ivy League school would never be a possibility. However, no matter all the hurt there is fierce family loyalty. It’s just an unspoken understanding. I think he does an excellent job describing a culture that is so hard to describe and understand without actually experiencing it. I so appreciate you taking the time to comment and share your perspective! I can remember reading this and wanting to be a fan. And being sadly disappointed in a Nickel and Dimed sort of way. I think a better book that would explain what happens to a community when industry collapses is Glass House. Is it Glass House or The Glass Castle? I just wanted to check since others had recommended The Glass Castle and I wasn’t sure if there was more than one book? She may have had the mouth of a fish- wife but her heart was solid 14 karat. my father, David Blanton and all the others (who were always larger than life!) be portrayed on the big screen. It’s surreal– and thrilling !! And I trust* Ron Howard will do a great job. So stinkin’ proud of J.D.–and the rest of my family. It’s going to be a movie?! How cool! I will be looking forward to seeing it! Thank you so much for commenting and sharing about your family! Thank you for sharing — and I didn’t know it was going to be a movie!! I read the book about a year ago and thought it was very interesting. I also live in Appalachia, and while my nuclear family is nothing like the author’s, my extended family is not far removed and has many of the same patterns (very young/dysfunctional marriages to escape dysfunctional family life, lack of job opportunities and education, etc). I found it to be very accurate and truthful. I passed it to my father who loves to read. He read it and said he didn’t think it was interesting at all because he has lived it and it’s all around (which is interesting in and of itself). I highly recommend this book to people who live in my area (Ohio), along with Dreamland by Sam Quinones. I heard J.D. Vance speak locally and I was impressed by how he didn’t get political, but just wants to help with the opiod crisis. You really should read Dreamland soon – it gives the background of how this became such a problem in our country. Thank you for recommending Dreamland! That’s so funny! I’m right in the middle of listening to this book right now! The language doesn’t bother me, I’ve always subscribed to the theory that you can say a lot of horrid things without using profanity and some really beautiful things using it. I’m really enjoying the book (his grandma is a hoot! ), I’m from Portland, Or so this is definitely a fascinating view into a very different lifestyle and area than what I grew up with. This book REALLY moved me, and being a strong Christian lady (and a homeschool mom at that) it seemed so out of what I would consider a “worthy piece of literature”. Allow me to explain, I went to visit my parents last fall. While there, I saw this book left on the night stand next to my bed. Bored, I picked it up and began to read. I COULD NOT PUT IT DOWN! I asked if I could take it with me for the 5hr road trip back home, to which my parents replied, “doesn’t matter to me, just another of those yuppie books SIL must have left when she was here”. What they didn’t know was this was very much the story of my life. I grew up in the town next to where the author J.D. speaks of. My father worked for the steel factory mentioned. I saw this lived out by many in our circles. The only reason were were not in as deeply as the family of the book was because of my Grandparents who lived nearby and made sure we spent our Sundays in church and spoke truth into our hearts and lives that there is a better way and that you are not your circumstances. Like J.D. I joined the military and moved away, but with that too came pain. And when I went home, I too saw my home with a different set of eyes. So, no, I did not like the language, but it made the story “real” and helped me to feel that I was right back in that little town living it word by word as I read the letters on the page. It helped me to renew a compassion for my family, those I grew up with and also a strong desire to go home to “be the difference”. I listened to about half of Hillbilly Elegy on a book on CD. The language and sexual references became progressively worse, so I stopped. I was disappointed because I wanted to find out what happened. 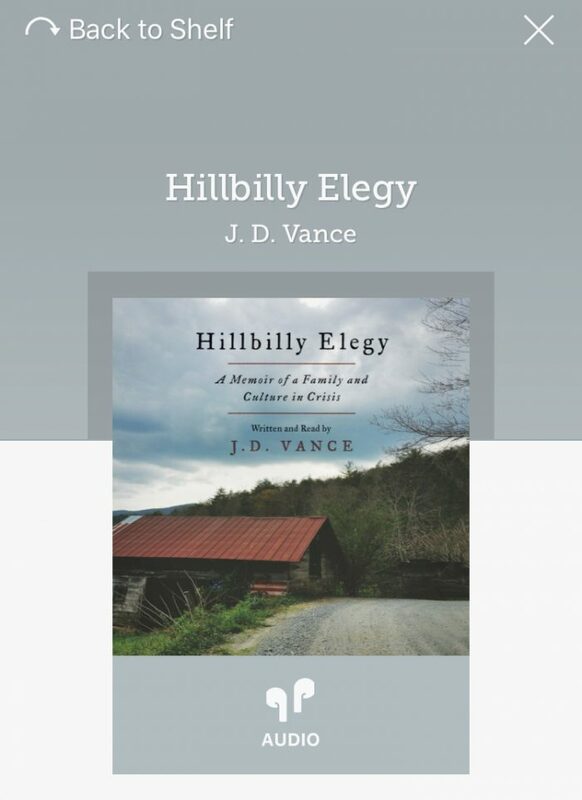 I disagreed with the premise that J.D.’s family problems stemmed from his grandparents’ hillbilly background. Their problems were caused by substance abuse. J.D.’s grandfather was an alcoholic which caused dysfunction in his marriage and in his children’s growing up years. J.D.’s mother successfully finished high school and college and had a career as a nurse until she started using drugs. Anyone who abuses drugs will have the problems that J.D.’s family had regardless of where they are from. Thank you so much for sharing your perspective. I read it, actually, listened to the audiobook version too, and found it fascinating. I agree, there is a lot of coarse language and subject matter but as you said, I think it was the author’s honest recollections. I later watched a short interview some news magazine did with him and his wife. Both seemed like people I’d like to have as friends. I grew up in a pastor’s home and have known many people like the author’s family…people my dad/our church tried to reach with the Gospel. I agree with the commenter who said where he grew up had less to do with his difficult circumstances than substance abuse did. Sin and brokenness is at the heart of any dysfunction we have in our lives. Crystal, I’d like you to consider making a list of audio books you have “read” for some of us to have recommendations. I’ve been out of the loop in reading more popular books over the past 20 years. I did download Libby and have a few on my list, but three of them are Hillbilly Elegy, Educated and Glass Castle, which have similar themes.